The 2014 Russian Grand Prix is set for Sunday, October 12 following qualifying on Saturday. 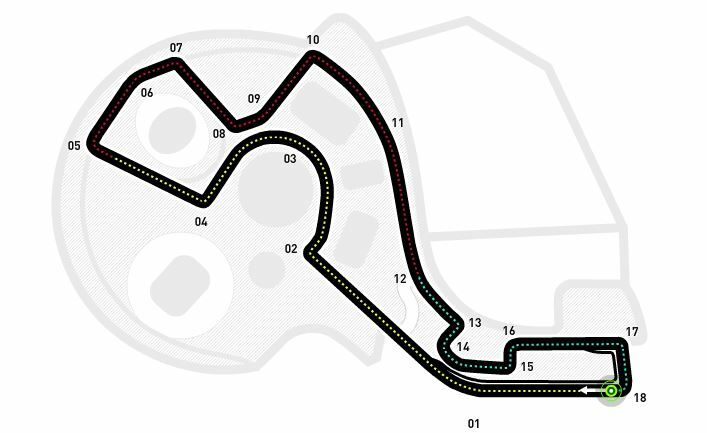 The race will be held at the Sochi Autodrom, a brand new circuit that was originally constructed for the 2014 Winter Olympics, starting at at 3 p.m. MSK (12 p.m. BST, 7 a.m. EDT). The race will be broadcast on NBC Sports Network in the United States, Sky Sports F1 in the United Kingdom, Sky Sport in New Zealand, and Fox Sports in Mexico, Central America, and South America. RTL in Ireland, TSN in Canada, OTE TV in Greece, on M1 in Hungary, Sky F1 in Italy, MTV Max in Finland, Polsat Sport in Poland, SLO 2 in Slovenia, Sport1 in The Netherlands, BBC in Belgium, RTL or Sky Deutschland in Germany, Nova in the Czech Republic, TV3+ in Denmark, SportTV in Portugal, Abu Dhabi Sports 2 in the United Arab Emirates, and Star Sports 4 in India are among the other broadcasters. Most of the broadcasters will also broadcast the qualifying. Live streaming is available on BBC iPlayer in the United Kingdom, CNBC Live in the United States, Tenplay.com in Australia, SKY in New Zealand, TELMEX in Mexico, Foxplay.com in Central and South America, Star Sports in India, Sporting Telenet in Belgium, and Nova in the Czech Republic, among other places. The Formula 1 schedule has only three races after this one–the United States Grand Prix on November 2, the Brazilian Grand Prix on November 9, and the Abu Dhabi Grand Prix on November 23. See qualifying results, current Formula 1 standings, and a preview below. 1. Lewis Hamilton, England, Mercedes, 1 minute, 38.513 seconds. 2. Nico Rosberg, Germany, Mercedes, 1:38.713. 3. Valtteri Bottas, Finland, Williams, 1:38.920. 4. Jenson Button, England, McLaren, 1:39.121. 5. Daniil Kvyat, Russia, Toro Rosso, 1:39.277. 6. Daniel Ricciardo, Australia, Red Bull, 1:39.635. 7. Fernando Alonso, Spain, Ferrari, 1:39.709. 8. Kimi Raikkonen, Finland, Ferrari, 1:39.771. 9. Jean-Eric Vergne, France, Toro Rosso, 1:40.020. 10. Sebastian Vettel, Germany, Red Bull, 1:40.052. 11. Kevin Magnussen, Denmark, McLaren, 1:39.629. 12. Sergio Perez, Mexico, Force India, 1:40.163. 13. Esteban Gutierrez, Mexico, Sauber, 1:40.536. 14. Adrian Sutil, Germany, Sauber, 1:40.984. 15. Romain Grosjean, France, Lotus, 1:41.397. 16. Marcus Ericsson, Sweden, Caterham, 1:42.648. 17. Nico Hulkenberg, Germany, Force India, 1:40.058. 18. Felipe Massa, Brazil, Williams, 1:43.064. 19. Kamui Kobayashi, Japan, Caterham, 1:43.166. 20. Pastor Maldonado, Venezuela, Lotus, 1:43.205. 21. Max Chilton, England, Marussia, 1:43.649. SOCHI, Russia—Formula One championship leader Lewis Hamilton, bidding for his fourth consecutive race victory, will start from pole position at the inaugural Russian Grand Prix. Hamilton earned his seventh pole of the season by beating Mercedes teammate Nico Rosberg by two-tenths of a second in Saturday’s qualifying. Williams driver Valtteri Bottas was faster than Hamilton for two sectors in his last lap but then went wide in the last corner and stayed third. 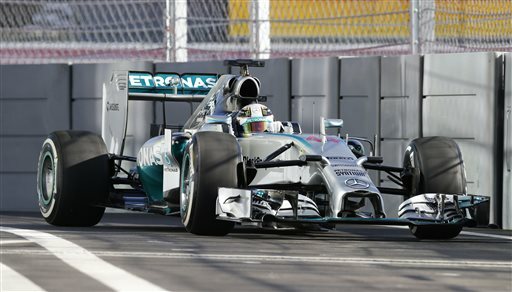 Hamilton leads Rosberg by 10 points and is seeking his ninth victory of the season. He has won the last three races — in Japan, Singapore and Italy — and Mercedes can wrap up its first constructors title if one of its drivers wins Sunday’s race. “Pole is a great place to start from,” said Hamilton, who is seeking his second championship after winning the title in 2008. This was his 38th career pole. Hamilton is clearly a fan of this Black Sea resort and the Sochi Autodrom around the Olympic Park, where the Winter Olympics were held in February. “But it will be tough tomorrow, it’s a long way to turn 1,” Hamilton said. Hamilton said he had no idea how important it was to start on pole on the circuit, since it has never been used for a Grand Prix before. The sunny and warm weather was in contrast to last weekend’s race in Suzuka, Japan, held in heavy rain and fading light. Hamilton’s victory there was overshadowed by the accident that left Marussia driver Jules Bianchi fighting for his life in a hospital. Bianchi lost control in wet conditions and ploughed into a tractor recovering another car that crashed out at the same spot one lap earlier and suffered a severe head injury. The Marussia car is racing only one car this weekend in a sign of respect for Bianchi and drivers have stickers on their helmets expressing support for the French diver. Hamilton and other drivers praised the smooth surface of the Sochi Autodrom, saying there was good grip while almost no tire wear. 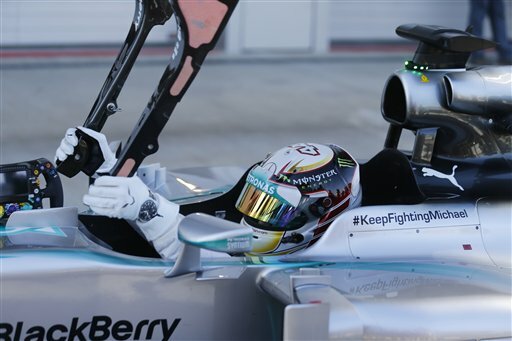 “It’s a fast flowing, medium to fast circuit and it should make for an interesting race,” Hamilton said. With 125 points at stake in the remaining four Grand Prix of the season — including 50 at season-ending Abu Dhabi — Rosberg said every race was important. Bottas said he did not know how close he was to the pole. “Maybe I took it a little too hard on the tires at the start of the lap. 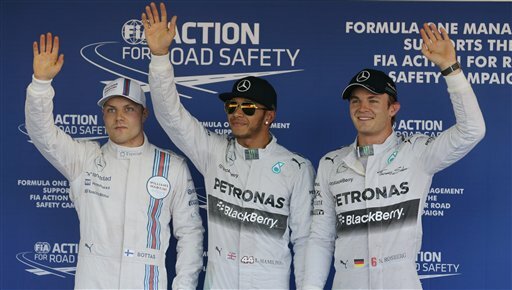 I risked too much in the last corner and went wide,” Bottas said. “It’s not nice to make a mistake but Mercedes have been very fast in the last sector all weekend and maybe I lost one place,” the Finn said. Four-time defending champion Sebastian Vettel failed to make the third and final qualifying session in his Red Bull but because Kevin Magnusson of McLaren will be dropped five places for an unscheduled gearbox change, Vettel will move to 10th. Magnusson falls from sixth to 11th, allowing Daniel Ricciardo in the other Red Bull to move up one place to sixth. Jenson Button of McLaren will start fourth and Daniil Kvyat delighted home fans by taking fifth place for Toro Rosso in his best qualifying result.